Eon Bancroft copped the best boxer award, Imran ‘Magic’ Khan survived a third round scare and the Guyana Defence Force (GDF) lifted the Best Gym trophy in the two-day action packed National Open Boxing Championships which concluded yesterday at the Andrew ‘Sixhead’ Lewis Gym. Bancroft of the GDF, notched up his 58 amateur win after he boxed his way to three-nil victory over his gym mate and arch-rival Ron Smith in their welterweight contest. 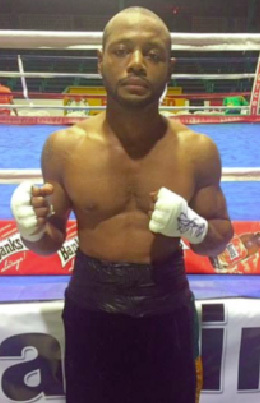 In what was a highly competitive matchup of two of Guyana’s best welterweight amateur pugilists, Bancroft got the judges nod as he earned a hard-fought victory and the best boxer award. The highly touted Junior Sportsman of the Year, Khan, dominated for the first two rounds of his lightweight encounter with GDF’s Clairmont Gibson but the latter stunned those in attendance as he unleashed a thunderous right hand to Khan’s abdomen that sucked the air out of the ALBA Games bronze medalist. 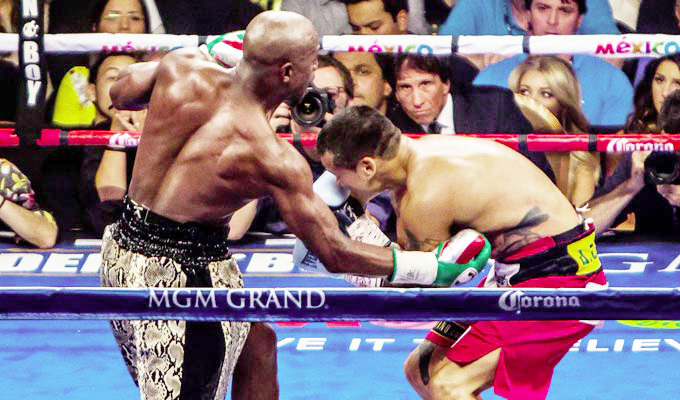 After an eight-count by the referee, Khan was there for the taking but Gibson failed to land another home run punch and clinch what would have been the biggest amateur boxing upset of the year. In other results, flyweight, Dellon Charles of the Forgotten Youth Foundation (FYF) Gym, defeated his gym mate Richard Subrate after the latter retired in the third frame. GDF’s Burt Braithwaite notched up two victories, winning by first round knockout over his gym mate and fellow welterweight, Ryan Jeffers and by a walkover from Stephan Gouveia. Dennis Thomas of the Guyana Police Force also chalked up two victories. The talented light heavyweight had a walkover victory over GDF’s Mark Pierre and forced his gym mate, Oliver Charles, to retire in round two. Travis Hubbard of Harpy Eagles Gym (HE) and Quincy Boyce won their respective bouts, three-nil. 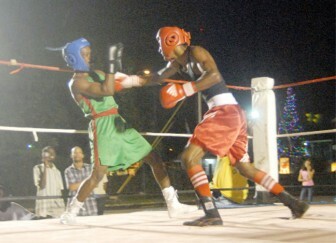 Hubbard out boxed Joel Williamson of the Pocket Rocket Boxing Gym (PRBG) while Boyce defeated Dawani Lampkin of FYF gym. 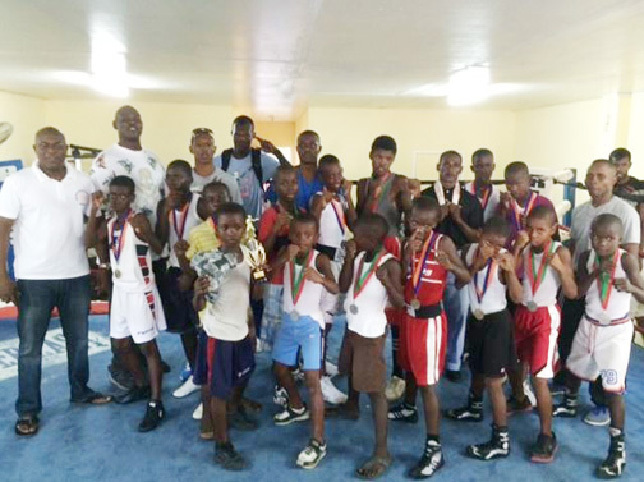 Other winners were Jaime Kellman (45-49 pounds of Young Achievers), Malrick Walcott (50-54 pounds of Essequibo Boxing Gym), Kevin Mullings (55-59 of HE), Theo Bumberry (60-64 pounds of FYF)Shamar Bumberry (70-74 Pounds of FYF), Jamal Eastman (80-84 pounds of PRBG, Cordell Walcott (85-89 pounds of Essequibo’s Boxing Gym) , Tyron Lashley (90-94 pounds of Rose Hall Jammers) and Junior Henry (105 to 109 pounds of FYF gym). GDF gym accumulated eight points to lift the best gym award. 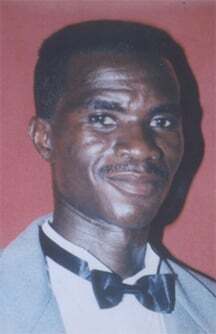 President of the Guyana Boxing Association, (GBA), Steve Ninvalle in an invited comment intimated that the championships which was the last senior championships for the year, was very successful except for the rains which caused the latter part of event to be switched from the Banks DIH Car Park to the Andrew’ Sixhead’Lewis Gym. Ninvalle also mentioned that most the objectives that the association set out to complete this year were completed and commended the executive for a job well done. 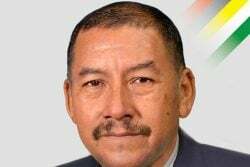 “We were able to complete what we said we would have completed I want to applaud our old and new executive, but the work continues next year where we will strive for greater heights” Ninvalle declared. The next amateur tournament is set for later this month when the association will box off the DDL/GBA under -16 tournament.